Spring has officially sprung, assuming you live on the same side of the equator as I do. Now that the balance between night and day is shifting, no matter how imperceptibly, we can anticipate new birds in our immediate vicinities. Work kept me from exploring the wilds, but why bother when Common Grackles, resplendent in blue, purple, black, and bronze, have returned to raid my feeders? Corey could have chosen his first Piping Plover or Eastern Phoebe of the year in New York as his Best Bird of the Weekend and either would have been an understandable pick. 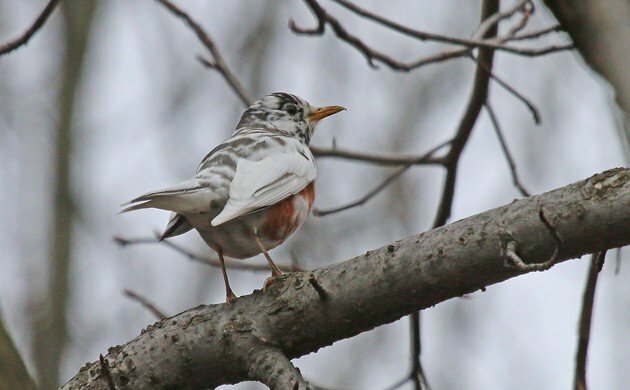 Instead, he chose one of his favorite individual birds, or at least a descendant of one of his favorite individual birds, the white American Robin of Alley Pond Park. It, or its descendants, have been present in the park since at least 2009. A bunch of highlights this weekend. My first ever Terek Sandpiper in New Zealand. 21 little Wrybills looking all wry. But I have to give the nod to a flock of Red Knot, as it’s the fist time I’ve seen them in their summer finery, all red and ready to fly north. Aren’t knots great in alternate plumage? Such a transformation from bland birds. While photographing a small group of Franklin’s Gulls now in breeding plumamge, and before they migrate north, I was able to spot my first ever Cassin’s Kingbird. A real surprise Lifer!! Not technically during the weekend but during the week, I was pleasantly surprised to see an American Kestrel in North Philadelphia. Made my day!